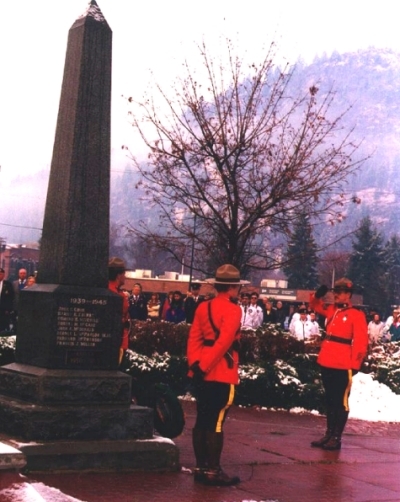 The Grand Forks Cenotaph was constructed in 1921 in memory of those who sacrificed their lives in World War I. `The polish grey granite Cenotaph was constructed by Alexander Ritchie, Campbell & Ritchie Mon. Co., in Nelson, British Columbia. Dedications to those who sacrificed their lives in World War II and the Korean Conflict were also added. The names of those who lost their lives in World War I and World War II are inscribed on the Cenotaph. Harry H. Euerby George W. McParlon M.M.